Karen is a Java Developer at Scand. 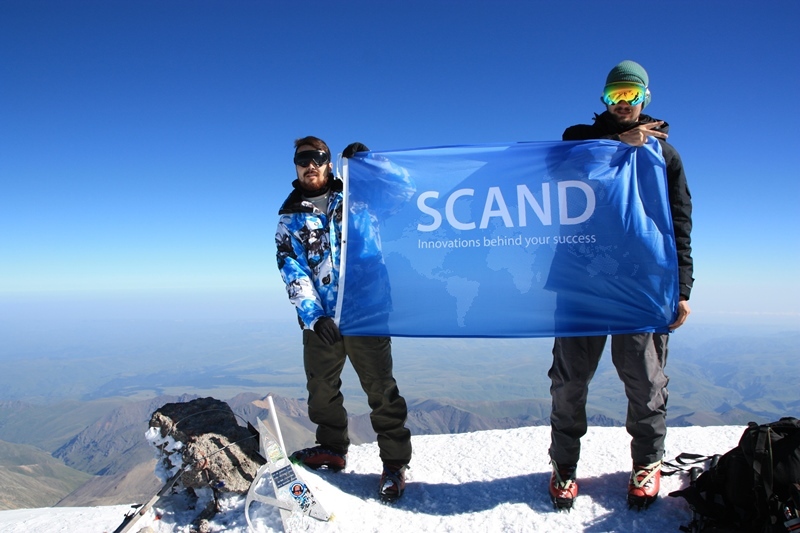 August 20, 2016; he effected an ascent of a mountain and placed a Scand flag on the very summit of it. The whole team is so proud of you! Karen is keen on sports and programming and recently he has taken the mountain summit of 5642 meters that is located in the Russian Federation. Yes, it’s Elbrus. This mountain is one of the 7 highest summits in the world. We decided to have a small talk with him and get to know what does it mean to be a Java developer and how come he decided to climb a mountain? – Karen, how did it happen you came to work at Scand? – It was my last year at the university when I was looking for my future employer and I had my practice at another IT company, so I was planning to be directed to work there after getting my certificates. Though, at the very last moment, I changed my mind and came to work here. I liked the atmosphere and the working conditions at Scand more. – What do you code and do you like the workflow? – It’s fine. At the University everybody was majoring Java, so I wasn’t an exception and had better skills in Java than in any other programming language. Some may say that Java coding is quite a routine activity but I love details and I’m a fan of careful planning, so Java is definitely my theme! – I see. I noticed that you a careful planner. You mapped up your trip to Elbrus in all details and even took a Scand flag with you! Could you shed some light on the whole preparation process for the trip? – I started getting ready for the coming adventure this March. The first thing was to hit the gym that is located just in the same building where Scand itself, it’s only one floor above my office. The company shares the gym entrance fee, so I was using the opportunity. On the initial stage of the training routine, I was visiting the gym three times a week getting physically ready. Last 1.5 months before the trip I additionally took up jogging. friends (I had many cards with greetings prepared). Basically, I took tons of pictures will all this stuff. – Were your colleagues and the management supportive of your decision? – To tell you the truth, not many people knew about my adventure. I’m not a chatterbox. Plus, if I had told everybody about my plans and then due to some unknown reasons they wouldn’t have entered into life, I would feel quite uncomfortable. A couple of my best friends and work colleagues knew my agenda and it’s funny that even my parents still don’t know about the Elbrus thing. – How big was the team to climb the mountain? – We were a group of 6 people and the guide. I was the second from the group to reach the summit and actually I spent there too much time (more than an hour and a half). Owing to my staying on the top for too long I started to experience a headache, and all the way down (around 8 hours) I still felt dizzy. – Ok, you spent 8 hours going down, but what about climbing up? How long did it take? – It took us 12 hours. At first, we had to live for 5 days half way to the summit at the 2000m elevation and then for 2 days at the 3900m elevation. That was a must thing and helped to avoid having serious health issues afterward. – Sounds terrific. What is the next peak to conquer? – I’m thinking of doing Kilimanjaro in two years. This mountain is higher (over 5800m) and has more difficult zones to climb. Anyways there is still years to get a better physique and to earn dough for the trip and everything! – Good luck, have a great day and see you!